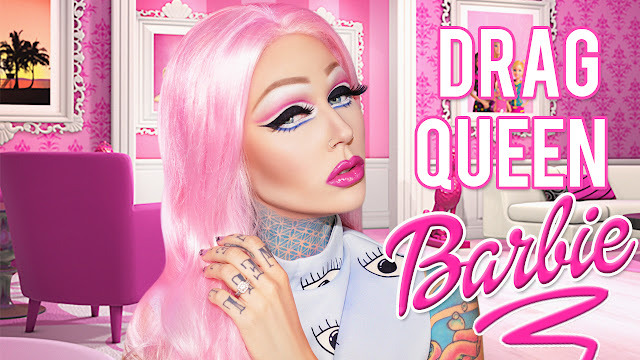 Urban Decay Drag Queen Barbie Makeup + Contest! A couple days ago kicked off the @urbandecaycosmetics Halloween contest!! I'm so excited, they've asked me to be one of 3 judges for the contest! Is this even real life?! I was asked to do a "fun" look, what's more fun than being a queen AND being Barbie?! I'm COMPLETELY new to drag makeup, and it's harder than it looks ladies and gents, but they didn't stop me from trying! Now's your chance to win a buttload of epic Urban Decay goodness worth $500! How to enter: post your #halloweenmakeuplook using the hashtags #UDHalloween & #UDContest in your caption OR upload your look at www.UDHalloween.com for a chance to win! Winners will be picked at the end of October by the panel of judges: myself, @creativeboss & @kaush_m ! Please be sure to read all of the rules at www.UDHalloween.com so that all of your hard work and creativity counts! Also, don't forget to use as many Urban Decay products as possible when creating your look. I've been checking out some of your looks so far, and they are IMPRESSIVE! Can't wait to see more! Open to legal residents of the 50 United States (D.C.), Canada (excluding the Province of Québec), and the United Kingdom. Void in Québec and where prohibited. 18 and older.